I had been reporting on "horse fart culture ((馬屁文化),)" in Taiwan and the United States (see, for example, here). I would be totally remiss if I leave anyone with the impression that China is over and above this kind of behavior. At one time, China was among the world leaders in the practice of the Cult of the Personality, and that is the essence of horse fart culture. The following is a translation from an essay by Yu Jie collected in A Son of Tiananmen. According to Xinhua, a strange incident at the flood-fighting frontline in Weinan City, Shanxi province: On the evening of September 10, the flow from the Luomin River into the Weihe River was successfully sealed. Yet, on the next morning, there was a 'performance' ceremony for another successfully sealing, in order to make sure that the various officials and leaders can come over to take part. 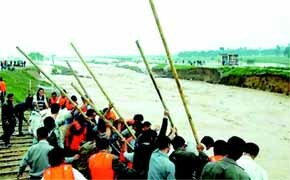 After a dozen days and nights of struggle, at 10pm on September 10, more than 1,000 People's Liberation Army and militia policeman at the Weihe dam finally sealed the water flow from the Luomin River into the Weihei River. Obviously, the soldiers and policemen should get to rest. Instead, on the morning of September 11, the soldiers and policemen assembled again in the same spot. This was because a number of local leaders needed to have a huge "sealing" ceremony. At around 9am, the reporters saw that preparations were being made to hold a ceremony. 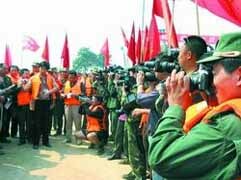 The leaders from the Weinan City Forestry Department busied themselves with setting the "scene." They told the soldiers to put a number of sandbags at a designated location so that the leaders can use them. At 930am, more than one thousand PLA soldiers and militia policemen stood in formation under the intense sun on the dam to wait. At 935am, a convoy of more than a dozen sedans arrived at the Weinan river dam. The "ceremony" was actually fairly complicated to plan, so the ceremony that was scheduled at 10am did not start until 11:21am. The soldiers had been standing in the intense sun for more than two hours. After the leaders moved into position, some soldiers moved a few sandbags symbolically to the breach that was already sealed, with red flags fluttering in the background. Prior this, the official in charge of directing people had already instructed them clearly: "You only have to make it look good." Thus, after a short three minutes, the Weinan City leader declared: "The breach that allowed the Luomin River to flow into the Weihe River has now been successfully sealed!" Thereafter, the ceremony moved back to the Weihe dam. First, the leaders were introduced. Then the leaders read off the awards list, the congratulatory messages and then the leaders gave speeches. While the ceremony was going on, some of the warriors who had been working non-stop for days could not endure anyone. The reporters saw that some warriors in the back had sat down, and some of them were even sleeping. On the program "Forum" on the CCTV news channel, two expert scholars were invited to discuss this particular Xinhua report. As everybody knows, it is difficult to speak the truth on CCTV. These two scholars could only broadly talk of "officials do not know how to use their power properly" and "officials should not build up their image in this manner." I noticed that there was a news photo in the background: just when the leaders were speechifying, a number of PLA soldiers and militia policemen were asleep right there on the dam. That was mostly derived from this Xinhua report (via Sohu.com). There is actually quite a bit more about given in a follow-up article in Nanfang Weekend a month later. The follow-up is about the spin campaign by the local officials to dilute the original Xinhua report and then a later Xinhua editorial again titled "The Cadres Should Avoid Three Types of Superficial Habits" which used the Weinan incident as illustration. When that Xinhua editorial appeared on October 14, the Weinan Daily News routinely republished it. Sometime that morning, a Weinan official charged into the newspaper's office and yelled, "How could you print something like this!" According to people, "He has never ever been so upset before." As a result, all undelivered and unsold copies of the Weinan Daily News were seized and destroyed and the newspaper printed another edition with the Xinhua editorial deleted. It was a historical first for the newspaper to have two editions on the same day. The first edition is now a collectors' item. So the first point about this is that "horse fart" culture is universal -- it will emerge whether the country is a full-blown democracy or a totalitarian regime. However, there is a big difference in terms of how the media treat such incidents. Not long after some 1,000 firefighters sat down for eight hours of training, the whispering began: "What are we doing here?" As New Orleans Mayor Ray Nagin pleaded on national television for firefighters - his own are exhausted after working around the clock for a week - a battalion of highly trained men and women sat idle Sunday in a muggy Sheraton Hotel conference room in Atlanta. Many of the firefighters, assembled from Utah and throughout the United States by the Federal Emergency Management Agency, thought they were going to be deployed as emergency workers. Instead, they have learned they are going to be community-relations officers for FEMA, shuffled throughout the Gulf Coast region to disseminate fliers and a phone number: 1-800-621-FEMA. Thirty years ago, this might have remained as a local story in Salt Lake City. Today, this story and the photo flew quickly around the Internet. Perhaps that photograph has some PR value when it first came up; but the net effect now is hugely negative. If the president's handlers had to do it all over again, they would not have done it -- that is, if they are not stupid. Meanwhile, from the Chinese case, it would appear that the media worked. The event was reported by no less than a reporter for the official news agency. The story and the photos flew quickly around the Internet, drawing appropriate disgust and outrage and triggering investigation. What is the difference between the United States and China? The difference is that in the United States, the media look for all occurrences of such behavior. The Salt Lake City Tribune or any other newspaper have no compunction. This was their moment of national fame (when was the last article that you read in the Salt Lake City Tribune? ), and a good story may even get them a Pulitzer Prize. By contrast, the Chinese incident was an aberration. Considering how that local official came screaming into the Weinan Daily News to force the retrieval and destruction of all undistributed copies of the newspapers, what is the likelihood of that newspaper ever reporting further manifestations of "horse fart" culture? And the media culture is the basis of the 'horse fart' culture!